I know some of you out there will give me crap for this but I wAs playing with the California vanity plate site and it had GVR4, available. I couldn't believe it, so I ordered it. I was debating on that or getting 1736/2k. I thought it was cool. For my collector plate, I chose 1899 as my first option and they had sent me my less desirable 2nd option, GVR4. I'm gonna try to get it changed to my 1st option though. Good luck with your plates. I was thinking of 7eleven or seven11. You have to pay extra yearly just to keep the vanity plates and right now there are more important things that need attention rather than a silly license plate. Besides, mine already says, RNV-463. If only they could've thrown a G in there. 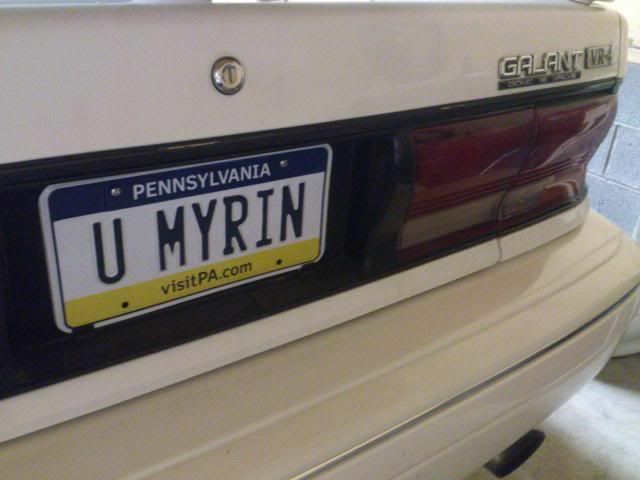 I don't know why some people hate vanity plates so much. We have to have a front plate in Ohio, so it might as well be cool. Watcha guys think? Should I pull the trigger? Nice Brett. I didn't like "GVR4" for very long, so I had it changed to "1899 2K". MN requires no front plate for a collector and at least one letter. you do it in maryland and ill get mine here in nevada ! Mine say 729 GVR4. But I'm do so I was going to see if either SLEEPER or OG EVO are available. damnit wish OP started this thread a month earlier...would've prob done my screenname as my plate but i think it's too close to sticker renew time. how does the personalised plate work in the states, here in nz we type in the plate we want on a website and if its not taken you pay $900 and its yours. Depends on the state. But in WA, we choose the plate online and if it's not taken and the state approves it (they don't approve anything in poor taste ) you pay an extra $40ish dollars per year. My license tabs every year for the GVR4 cost me about $80 total. The Audi is only about $40. Other states can be much higher. I think U JELLY would have been better. I love U JELLY, but people would look at you funny driving a GVR4. "dafuq you got that I'm jelly of?" I'm changing mine to 4DR DSM. Here is my old plate. Hows that local ghetto slang go, when you want to say "Everything"? 3 channel ABS? I keed. Generated in 0.008 seconds in which 0.005 seconds were spent on a total of 4 queries. Turbo powered.